Bus from Singapore to Tioman Island is a popular and highly sought-after bus service, especially for diving lovers and beach lovers. This bus to Tioman Island actually includes two services, which are the bus from Singapore to Tanjung Gemok jetty and the ferry from Tanjung Gemok jetty to Tioman Island. Discovery Tours and WTS are the operators providing the service of bus from Singapore to Tioman Island. Their service departure time from Singapore to Tanjung Gemok Jetty is at 6:30am and the coach usually arrives around 10:00 – 10:30 am morning (total about 3-3.5 hours duration). The second part of service (Ferry from Tanjung Gemok Jetty to Tioman Island) is usually at 11:00am, depending on tidal condition. For the return trip, ferry departure time from Tioman Island jetty is usually between 12:00 – 2:00pm and it usually takes 1.5 hours. Hence, the ferry usually arrives at Tanjung Gemok Jetty depending on tidal condition. Discovery Tours and WTS Bus’s returning time is at 5:00pm, but it usually changes according to ferry arrival time to fetch passengers back to Singapore. For example, if the tidal condition is not favourable, the ferry arrives at the jetty at 6:00pm. The bus will then delay the departure until 6:00pm. The bus fare for single way bus from Sinagpore to Tioman Island is at SGD 40.00 and 2-way ranges from SGD 80.00 to SGD 90.00, depending on travelling season. 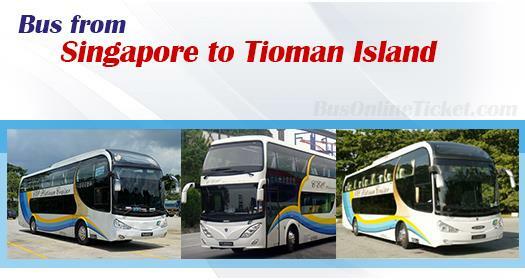 In fact, both Discovery Tours and WTS only allows 2-way booking for bus from Singapore to Tioman Island. 1) The journey for bus from Singapore to Tanjung Gemok Jetty is about 3-3.5 hours, depending on traffic condition. 2) Ferry from Tanjung Gemok Jetty to Tioman Island is about 1.5 hours, depending on tidal condition. In Tioman Island, there are five popular jettys, namely Kampong Genting Jetty, Kampong Paya Jetty, Tekak Jetty, Kampong Air Batang Jetty and Kampong Salang Jetty. Visitors usually drop off at one of the jetties which is closer to their resort. For example, visitors staying in Berjaya Tioman Beach Resort will drop off at Teka Jetty. Therefore, visitors are advised to book the resort and arrange the jetty pick up with the resort before booking bus from Singapore to Tioman Island. Planning to spend your next diving trip or vacation in Tioman Island? Do book your ticket in advance online to avoid disappointment due to one schedule per day, only provided by WTS. All online bookings made in BusOnlineTicket.com are instantly confirmed and online booking is hassle-free.